I took my kid to Vegas. I am THAT mom. I know, I know. When I was young and single, I looked at parents who took their kids to Vegas with such judgement. What could possibly be going through their minds to tote their 20lb screaming baggage down Las Vegas Blvd. while sipping on their Yard full of fruity beverages…at 11pm?! I would see tantrum-throwing, French fry-chucking little darlings wrestled by their fun-seeking parents and think, “Where’s the sitter?” I mean really? Why would ANYONE take a kid to Las Vegas? It’s dirty and obscene, late-night and LOUD. It’s surely not the place to which good parents would want to expose their precious little cherubs! Why?! 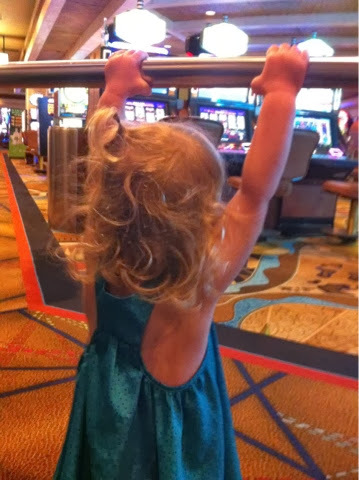 Let me tell you why, for me at least, this weekend in Las Vegas with a little cherub of my own, was pretty much awesome! Originally, Hfoe was going to make the drive out with me. I booked the hotel the week before because we weren’t certain what his work schedule would look like, and then, as it turned out, he had to work anyway. Darn that “being a responsible adult” thing. From our home in SoCal, the drive takes about 4 hours door to door. That’s a lot of Mickey Mouse Clubhouse for the kid and WAY too much for mama. So, I decided to leave super early with the hopes that Chuck would sleep, at least the first couple hours. Why I even make plans in my mind, I have no idea. Due to the fact that someone (not naming names, but she has beautiful blonde, curly hair) decided to fight sleep the night before and then rise with MY alarm the morning of our departure, it took twice as long to get out the door as I wanted. So, finally on the road at 6:53am, we were on our way, the two of us, to meet up with my younger brother and his girlfriend for a few fun days in the sun! Brosky lives in TX and we only get to see each other a couple times a year. Last March he turned 21. It so happened that Hfoe and I were going to LV around the time of his birthday for the National Elk Calling Championship for which hubs was a contender…. (a man of many talents, I tell ya!) Well, on a whim, my brother and JB, his girlfriend, decided to fly out to join us. It was so fun to see them and hang out that we decided it would be great to make it an annual thing. That’s where this trip comes in. 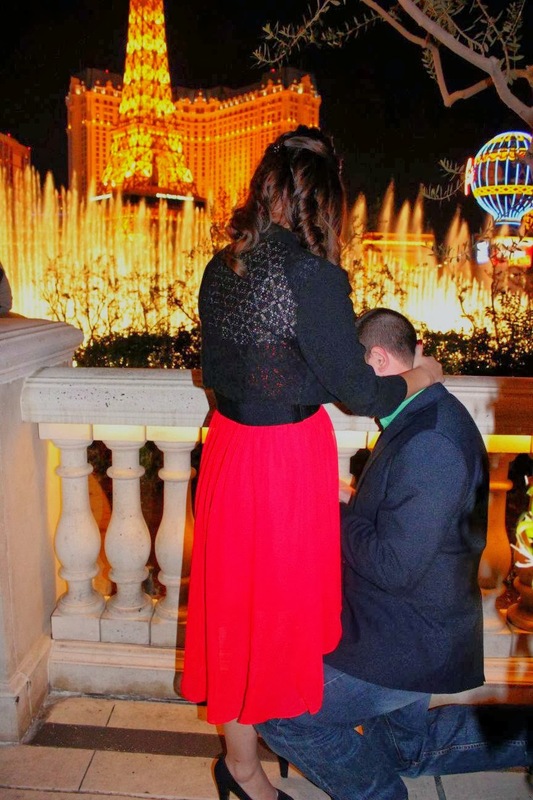 Brosky’s girlfriend, JB, has an awesome boss who, because she recognizes her success comes from her support staff, gave all her employees (and significant others) an all expenses paid trip to Vegas! So, two of my favorite people were going to be within driving distance for the second time in a year. Cool! Thanks super rad boss lady! We booked a room at the Treasure Island hotel again this year because last year Chuckles loved looking out our giant window at the pirate show happening 27 floors below us every night. This year, unbeknownst to me, the pirate show had been permanently discontinued. No problem. The hotel is still nice enough and as long as I had a working TV to entertain me at night when I had to turn in early with the nugget, I would be fine….except I didn’t. No pirate show, the TV didn’t work and then AFTER I bought milk for the kid, I found out the fridge didn’t work either. Not looking so hot for a return visit TI! In their defense, they did eventually fix the TV and replace the fridge, so all was not lost. But, this lodging snafu was not enough to put a damper on our visit. I guess I never paid much attention to all the things there ARE to do with kids in Las Vegas. On the first day, we met up with my brother and JB and headed over to Circus Circus hotel. It’s a bit far down the strip and you definitely want to drive there, but I am so glad we did! Chuckles really enjoyed the rides at the amusement park and the midway games. Her uncle even won her a little plush flower! They also have circus acts every 30 minutes that are free to watch under the big top. She oo’d and aww’d at the silk dancer lady and covered her eyes every time it looked like she would fall. The kid’s a crack up! After our trip to the circus, we headed back to TI for an early buffet dinner before the kid and I turned in for the night and the big kids hit the town for the night life. The next morning, Chuck and I decided to check out the Discovery Children’s Museum close to downtown. Let me just preface this by saying, DON’T USE THE IPHONE MAP. You will end up on the bad side of town in a weird neighborhood. Once we got turned back around and actually found the place, it was really spectacular! 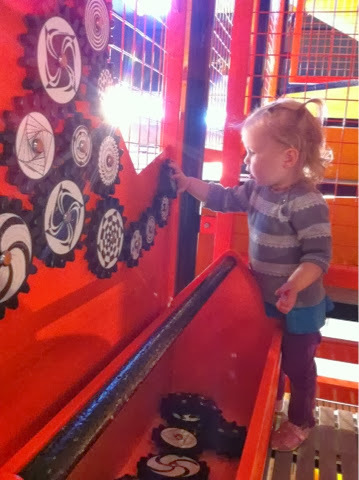 C loved all of the hands-on sensory exhibits made just for little fingers. The water room was her favorite. She got to suit up in a cute, animal-eared raincoat and soak herself with water play. What kid WOULDN’T love it! If you take the littles to Las Vegas, I highly recommend a visit to this place. 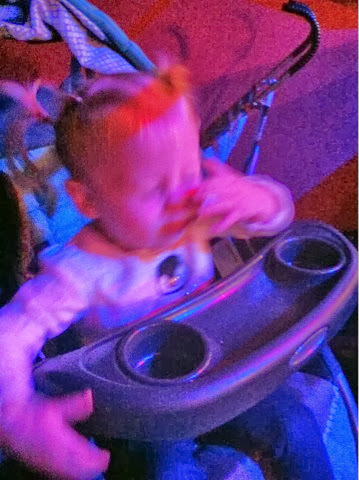 After a great rest, I loaded C into the stroller once more and we headed out to Planet Hollywood Hotel where we met up with Uncle K just long enough for him to gift C with a whole roll of 100 stickies…ammunition if you have read my previous posts! She was thrilled! We found the info booth for the shows happening in the hotel and immediately saw the flyer for the Popovich Animal Comedy Theatre. This was totally something Chuckles would LOVE! And it was starting in 5 minutes! We said bye to K and rushed in just in time to see the opening act full of balancing puppy dogs and trick playing cats. C did so well, staying still most of the show. Although, she was very concerned that all the dogs needed food. Her job at home is to help with feeding time for the pups. She takes her work very seriously! She also became upset when a miniature horse entered and then exited the stage without ever giving her the chance to “wide. Wide. WIDE! !” She’s gonna be a cowgirl, apparently. The show was worth the money and again, I would recommend it to anyone searching for entertainment for the nuggets! After the Animal Theatre, dinner and a couple hours downtime…it was showtime! You see, it was a secret, but the main reason for our trip was about to happen. I loaded C back into the car and we trudged our way through Friday night strip traffic down to the Bellagio to meet up with Uncle K and JB. Besides the lack of parking, the night was perfect. The temperature couldn’t have been better. Chuck wasn’t too cranky after her long, eventful day and at 10pm, right on schedule, the fountains started their dance. And I started snapping photos. It was beautiful. He took her hand and whispered something I couldn’t quite make out as he knelt down in front of her. At first, she thought he was kidding and she jokingly pulled away. Then, the realization that he was totally serious and this was absolutely her dream come true hit her and she said YES! And I was able to document it for eternity. Once their perfect moment was over, I paused from taking pictures long enough to hug my soon-to-be bonus sister and, of course, wipe away my own tears. What a humbling honor to be asked to share in such a pivotal moment in the life of two of the people I love most. So, as I said before, that was my “why” for having my munchkin out, on the strip, after dark, in “sin” city and it was totally, absolutely, unapologetically worth it! I am sure it’s not the reason for every stroller-wielding pedestrian in Las Vegas, but just remember that there is likely more to the story than meets the eye. And if you are crazy enough, like me, to take a little to Vegas, here are some other places I recommend from previous trips…. I have been holding my tongue for awhile now. I keep seeing uncensored comments and bold accusations flung to and fro amongst friends, acquaintances and total strangers. Words come from either side of a number of issues to the often unsuspecting members of an opposing view, whatever it may be. The only thing these comments have in common is that they come from other MOMS! Mean, hurtful and often HATEFUL remarks come out of the mouths (or fingertips, as it may be) of the very women who are meant to raise the next generation of respectful adults. It is no wonder that bullying seems to be a growing issue. It appears kids are learning how to bully, especially CYBER bully, from their parents. What in the world goes through the mind of a self-respecting human being who types some of these things to another person? Is the computer screen the buffer that dehumanizes the user on the other end? I mean, really? Is there no realization that you may actually have to defend your meanness in PERSON someday? I knew going into motherhood that there would be many polarizing topics spawned from the moment of conception. Caffeine or de-caff during pregnancy? Natural or medicated birth? Hospital or home birth? Breastfed or bottle fed? Co-sleep or baby in the nursery? Cloth or disposable diapers? All of these issues can definitely incite strong opinions and nasty comments from those close to us and even from total strangers. Everyone is an expert on parenting in their own mind. Their way is the “right” way. I get it. I have an amazing daughter and although I am not perfect by any means, overall, I am pretty happy with the parenting choices that my husband and I have made. However, my one solid truth it that MY way isn’t necessarily the RIGHT way. It is the right way for my family, but I would NEVER say it is the best choice for someone else. With that being said, the nastiest comments I have read regarding one of these hot button issues , both directed at me and at others, have been about vaccinating vs. not vaccinating. I have never been shy about the fact my family chooses not to vaccinate. I just thought that today, in light of some of the Internet bullying I have seen on BOTH sides of the subject lately, I would explain our story. You don’t have to agree with our choice, you don’t even have to like it, but you do have to be nice. Because, after all, how many minds were ever changed through hate and name-calling? Then, I met my future sister-in-law. She was the first person I ever met who actually questioned the way things were done. Talking to her about why her children weren’t vaccinated, I was still a skeptic. I mean, why would every physician I had ever seen “require” vaccines if they weren’t safe? I remember talking to my then boyfriend on the long drive home about his sister’s decision and I just didn’t understand. I hoped that she would choose to “protect” her kids from all the horrible illnesses someday in the future because I fell in love with them on the trip and I would have hated for them to die of polio! But, the seed to RESEARCH and make my own decision was planted. Fast forward to a marriage and 3 years later and we find out we are pregnant! Finally! We tried for 7 hard (in my mind) months to get pregnant. The month before that perfect, beautiful pink line appeared on the First Response, I believe I had an early miscarriage. I never confirmed this with a physician, but due to the irregularity of my cycle that month, and in my heart, I know I was pregnant once before. So, when we knew this little bean was sticking around for longer than a week or two, Hfoe and I were ecstatic! I immediately stopped eating deli meat, or caffeine or sushi or any other number of things on the “questionable” list. That September there was a listeria strain found in some melons grown in southern Colorado. I don’t even eat melons with much frequency, but just to be safe, I avoided ALL melon, watermelon and cantaloupe just in case! How horrible would it be if something happened to my little peanut and I had eaten one of the “no-no’s?” Would I forever wonder if that was the cause? It wasn’t worth that momentary joy of yum! I was fanatic about making sure this baby was “sticky,” as the mamas in my birth group would say. When I was 20 weeks pregnant I went in for a routine ultrasound and check up. I was weighed in and peed in the cup just like normal. My blood pressure was fine. Everything seemed fine. Until my doctor started listening for my sweet baby’s heart beat. It wasn’t there. He listened for 5 solid minutes, moving the ultrasound wand all over my belly. He tried the Doppler and he even shot little sound waves into my belly to “wake up” the baby or to get her to move. Nothing. I was so scared. Devastated. Sick to my stomach and, eventually, a crying, snotty mess. My OB said that because the baby had grown and I had felt kicks within the week, that he didn’t want to say our baby was gone. He scheduled me for a more in depth ultrasound the next week. So, we waited. That appointment could not come soon enough! At that appointment, the physician found baby girl’s heartbeat almost immediately! I burst into tears of relief. I know I must have shouted to him, “Why wasn’t it there last week? !” He said that sometimes that happens. Usually the baby has died, but sometimes, inexplicably, the baby is fine and the heartbeat is just undetectable. Looking back, I feel like this was a wake up call for me to realize that my precious baby’s life was fragile and also for me to know just how it felt to want to do ANYTHING to protect her. I didn’t know her name yet, or even that she was a “she” at that point, but she was the most important thing in my world from that moment on. I started researching EVERYTHING baby. 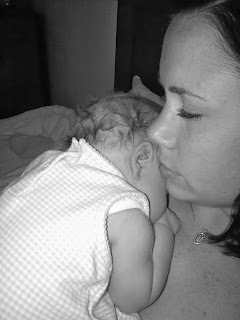 I knew I wanted to breastfeed…because I am cheap and booby milk is FREE! I thought I would try cloth diapering, but I wasn’t married to the idea. After reading and researching the effects of hormones and gmo’s on growing little bodies, I decided I was going to make every effort to start buying organic when I could. And, I was absolutely NOT going to co-sleep…haha…the best laid plans, right?! Then, I started seeing threads on my birth group message board about “vax vs. non-vax.” I read the topics and did a little outside reading, but in my mind, there was still no question. I was vaccinated and I was fine, so my baby would be, too. But, there was a nagging feeling in my mind. I couldn’t stop thinking about it. I would see some link on facebook and I would follow it. And from there I would follow another link, and another. I started reading peer-reviewed journals with topics questioning the levels of aluminum used in the vaccines given to two-month old babies. Aluminum was going to be shot into my baby?! Well, I wasn’t sure I liked that. But, she would be protected from measles, mumps and rubella for life, though, right? Wrong! Hfoe and I talked about it some and I shared the things I was learning. All along, though, I still just assumed we would go the conventional route and vaccinate our baby. Then, I did what I should have been doing from the beginning. I prayed about it. In prayer, I received a very clear message. Do not vaccinate YOUR baby. For those who don’t pray, you might call this a VERY strong, undeniable maternal instinct. Whatever you want to call it, the message was concrete. It was also clear that this was about MY baby…no one else’s. I was not meant to be some crazy zealot out to rid the world of vaccines. I was not meant to convince any other single human being that what was right for my child, was right for their child. See, here’s where the bullies on either side miss it….it’s not about YOUR kid. It’s about mine. Something that I have learned in subsequent research is that there is a strong link between genetics and the effects of aluminum and/or mercury on the brain. The levels of these heavy metals may be totally fine for one infant, but for one who is genetically pre-disposed, it may result in neurological damage. The problem is that you won’t know if your kid is predisposed until they get the dose. Except, I feel like I got a warning of caution. Would my baby girl have been one of the thousands of cases that end up in “Vaccine Court” due to vaccination injury every year? Maybe…maybe not. But, I whole-heartedly feel that she would have ended up with some sort of negative reaction if we had gone the conventional route. And after knowing what it felt like to lose her, even for that week, I wasn’t going to do anything against those instincts that I felt were working to protect her. Because that’s what all good parents do, right? We would go to the ends of the earth to make sure our babies are safe and happy and HEALTHY! So, I guess here is my point…This is NOT an anti-vax post. This is simply our story. This is how we made one of about a billion parenting decisions we will make over the course of C’s life. This just happens to be a pretty important and controversial decision. YOU have to make the decision that is right for YOUR family. Please go away from this with one message…BE NICE! In our disagreements and our differing opinions on any topic of much interest, you must consider that we can only go on our own personal experiences. You have not lived my life and I have not lived yours. I have faith that when it comes to parenting, though, you will make no decision to KNOWINGLY hurt your child and I hope that you will believe that about me. If that’s the case, then name calling and finger pointing serve no purpose but to be mean. And no one wants to be a mean mommy.